Volunteers - thanks very much for offering to support your team during this Roads Less Traveled Relay Race. Relay races would not be possible without the efforts of the volunteers. Many volunteers have told me that they really had fun, feeding off the good times the runners are having. I certainly hope this is the case. To help you prepare, if you haven't already, please review the information on the race's website by clicking on the Volunteers menu button. And please be sure to read the Volunteer Handbook (go to Race/Captain/Forms Handbooks & Logos) and to review (go to Race/Volunteers/Volunteer Assignment) your exchange before you arrive. The online selection process will start the week after registration closes. The exact date and time the process will go live will be emailed to team captains and to all volunteers in the database. Following are the instructions. Please read carefully. It is strongly suggested that you review what exchanges/assignments are available for the team volunteers BEFORE the process goes live and have a second, a third, and even a fourth option just in case. Log in to your team as normal at this link. In the left column, under Team Details, Add runner/volunteer, and Edit team/password there will be a box that says Volunteer assignments. This box will not appear until the process is scheduled to start, so if not visible, you are a bit early. Refresh your page until the box appears. This will take you to the Volunteer Assignment page. YOU MUST HAVE VOLUNTEERS listed in the database to be able to assign them. 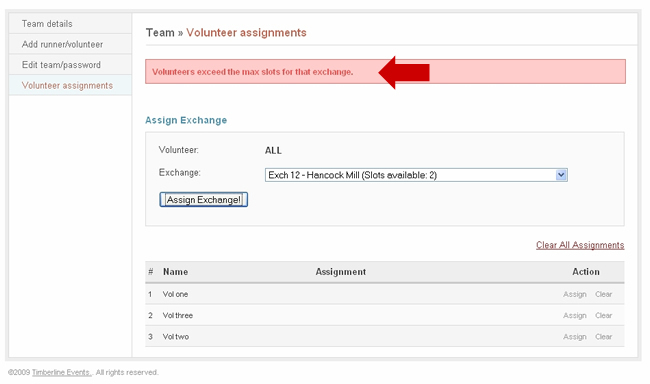 You can add volunteers by clicking the Add runner/volunteer box at any time. You can also edit any volunteer information that is currently entered. Notice the Exchange drop down box - this is how you choose the exchange you want to be assigned to. So the first thing you need to do is pick the exchange in the drop down box. Each line of the Exchange information includes the location, the reporting time, and the number of volunteer spots available. If the exchange is NOT LISTED, then the exchange is either being staffed by a non-profit group, or the volunteers slots have already been filled by another team. Remember, it is first come first served. 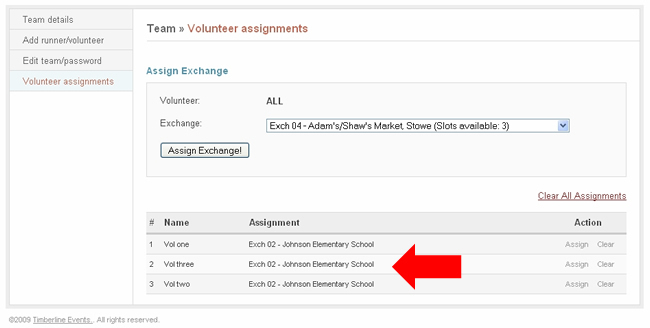 When you see the exchange next to the volunteer's name in the Assignment column , you know you were successful. This will ONLY work if there are still all the spots available for all your volunteers. If not, you will get a message that you exceeded the slots for the exchange. You will then have to select a new exchange. Remember, just because the exchange is listed when you started does not mean another team is also trying to select that exchange. If they click Assign Exchange before you do, they will get the assignment and you will get this message. It is first come first served. 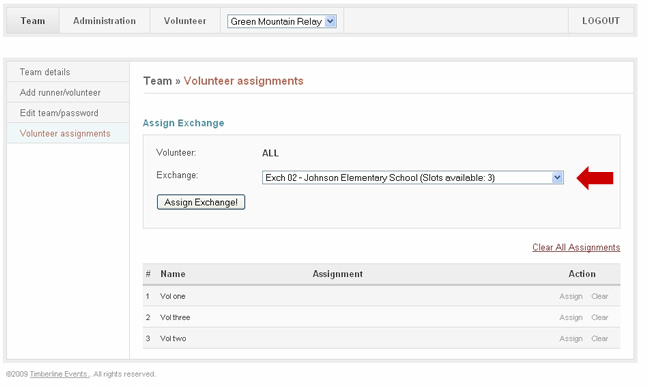 If you want to clear all of your volunteer's assignments, click the Clear All Assignments link. 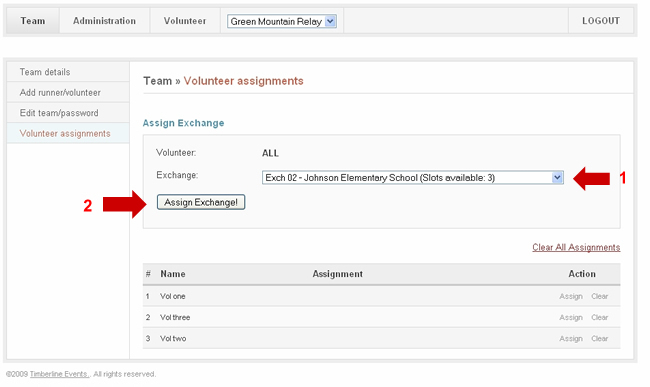 To clear an individual volunteer's assignment, click the Clear link next to their name. If you want to change a volunteer's assignment, just repeat the process explained above. You do not have to "clear" the assignments first. VERY IMPORTANT - when this process goes live, it is based on FIRST COME, FIRST SERVED so if someone selects the same assignment as you but clicks Assign Exchange first, you will have to repeat the process for a different exchange. Your volunteer's assignment is only confirmed if it is listed in the Assignment column. So I suggest you have a couple of options in mind. VERY IMPORTANT - there have been occasions where another member of a team did something to erase a volunteer's earlier selection. YOU ARE RESPONSIBLE FOR FOLLOWING THESE INSTRUCTIONS. If a volunteer loses their assignment due to the action of another team member, if is THE TEAM'S responsibility to deal with this. I can only go by what the database is showing. If you are not listed where you picked, someone else has changed your assignment. This process has been used successfully for several years and every "mistake" was human error. A confirmation e-mail will be sent to the e-mail address entered for the volunteer. I STRONGLY suggest you save the e-mail You can also track the progress online. If someone else is doing the selecting, you can refresh the browser page to see any changes. I will be available via e-mail when the process opens, but I will be limited in what I can do. If the exchange is taken, you must select another open spot. I am not responsible for you not getting your desired choices, or if your volunteers are all not at the same exchange. As the entry info AND the registration process stated and you (the captain) agreed to, volunteers must be flexible as the race is 200 miles long and lasts 36 continuous hours. If your volunteer has limited availability and you are not able to select an exchange that fits their schedule, there is nothing I can do about it. It is your responsibility to fulfill the volunteer option that you agreed to. You can check back over the next couple of days as there *might* be scheduling changes, but any changes will be made to benefit the coverage of an exchange, NOT to fit a volunteer's schedule. Your volunteers are responsible for getting themselves to the exchange and for being on time. Failure to do so will cause a team to be penalized, disqualified, or prevented from starting. 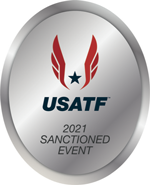 Due to the preparation needed to accommodate the volunteers, teams who have not assigned their volunteer(s) by three days before the day of the race will be considered to have not fulfilled their volunteer requirement and will not be permitted to start. Please ask questions BEFORE the process starts. If you log in after the start time, your selections will be limited as most teams are on it when the process starts.